Feeling ka-powed by the gazillion fashion weeks that have suddenly come into your consciousness? Have they deemed you unconscious? I know I’ve been feeling the punch. What used to be a few weeks every season (when fashion seasons were only two), has turned into a global year-long extravaganza. There are, of course, the main mode ports of call: New York (the FW13 shows were better than many US fashion excursions I can recall in recent years); London (we’re back, luv); Milan (ciao amore); and Paris (gush avec stilettos – and pointed ones, at zat) which make up Fashion Month. A handful of global cities soon followed suit – and like their Western counterparts, wore suits – both traditional and non. As I write this, Wills Lifestyle India Fashion Week AW13 in Delhi, Japan Fashion Week FW13 and World MasterCard Fashion Week in Toronto have all recently wrapped. Lakmé Fashion Week (another of many such weeks in the Motherland – this one showing Summer/Resort 2013 in Mumbai) is in full swing, and there was one other big one inbetween – I forget which. Do you blame me? All of this fashion ubiquity has led me to fashion oblivion, actually. There are dozens of shows each day appearing on hundreds of sites and it’s been a challenge to keep up with it all. As you know, I try not to read reviews and prefer to make up my own mind from runway shots, but it is hard to avoid the constant conversation that surrounds me on all mediums, digital and otherwise, 24-7. Then, there is the ‘hurry up and move on to the next thing’ mentality that has taken over our lives. It’s old news if it happened 10 minutes ago. Goth forbid we think about how things connect, or find their context and resonance within our lives. And yes, fashion is indeed personal to me. When I over-indulge, I do pay the price. Forgive me, my dears, I am still suffering from a prolonged case of fashion laryngitis. However, when I do manage to block out the noise of others, I start to hear my own voice again. I’ve been resting my voice for weeks (I know you’ll understand) but I’ve been listening silently to what’s been spinning down the catwalks – from couture to Calcutta … to cattle ranches? Well, that is only thing that can explain Tom Ford’s FW13 collection – his Texan roots. He’s been cited as saying the collection was inspired by Rihanna, but I noticed a few other influences. It was first and foremost the furthest thing from the Fordification that we know and love – the extreme sexed up simplicity of a slinky backless zippered dress or the cape that captivated the carpet and left others blushing for lack of trying. Ford for the first time since debuting his namesake women’s collection a couple of years ago via ultra-exclusive and intimate presentations, was on the official schedule at London Fashion Week. There was talk – much of it – weeks before the show. And he responded with a Wham! Tom went from couture catwalkers to cartoon characteristics in one season? Was he making fun of the cartoon characters of fashion, perhaps? He is a father now. Was it that more-is-more is indeed now more than less-is-more? It hit us with a wallop. Would we ditch our demure in favour of far-out and over-the-top? But wait, it wasn’t that far to go. Ford’s son likely has a Lichtenstein colouring book – cartoons would be too pedestrian. The ka-pow evening gown…the new power dressing? Super-Ford powers, ACTIVATE! It’s no wonder that pop art popped up everywhere – the wee wunderkind (by relation, nach) must be proud of his Pops. Whaam! 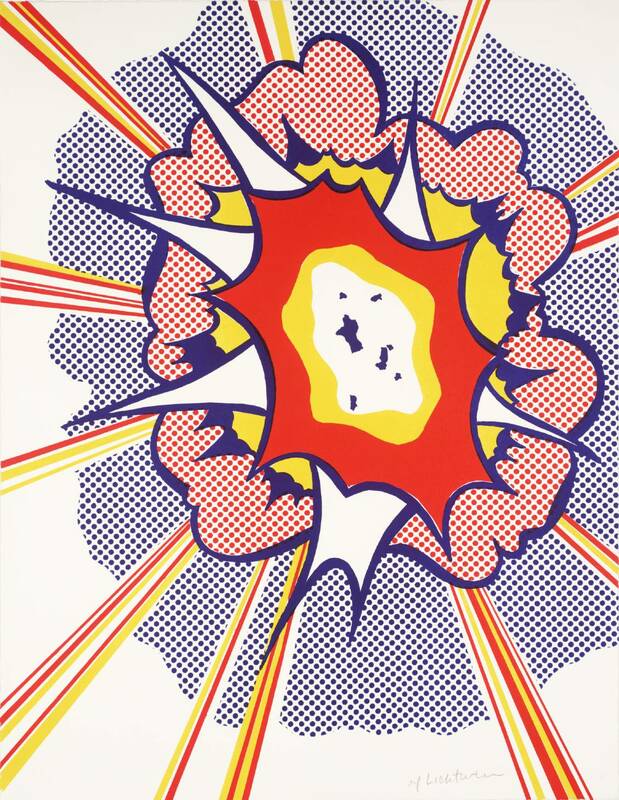 1963 by Roy Lichtenstein from the Tate Gallery in London. But, because I’m me, I saw beyond the Pops and the pop art and the pop tart. For me, it was a double-whammy. 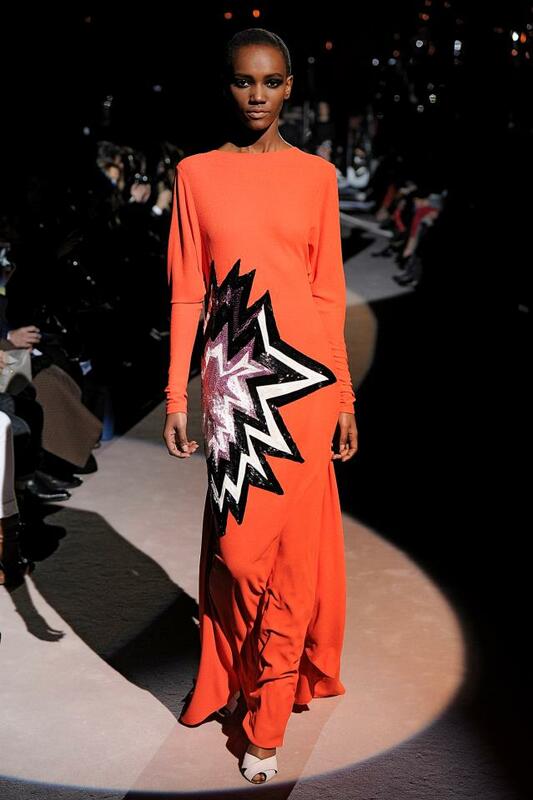 Tom Ford’s double-wham gown for FW13. 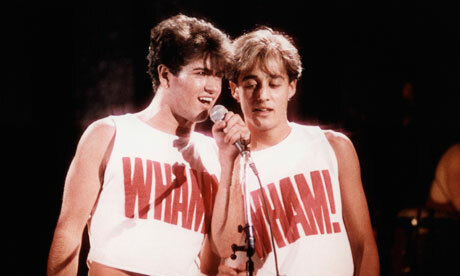 I can’t think of wham without thinking of well, Wham! The original double of Wham! – George Michael and Andrew Ridgeley. 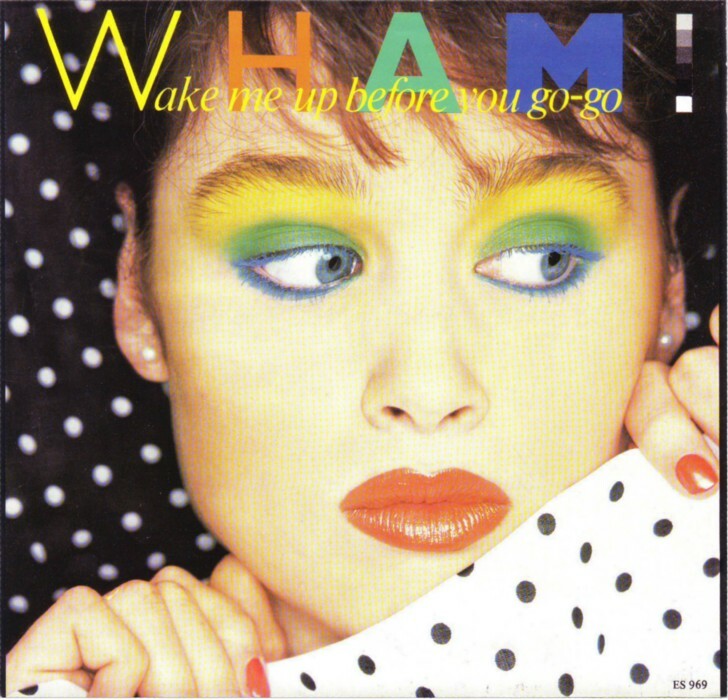 To bring it full fashion circle, their cover sleeve for Wake Me Up Before You Go-Go mixed multiple colours and prints, too. The cover that wakes one up. 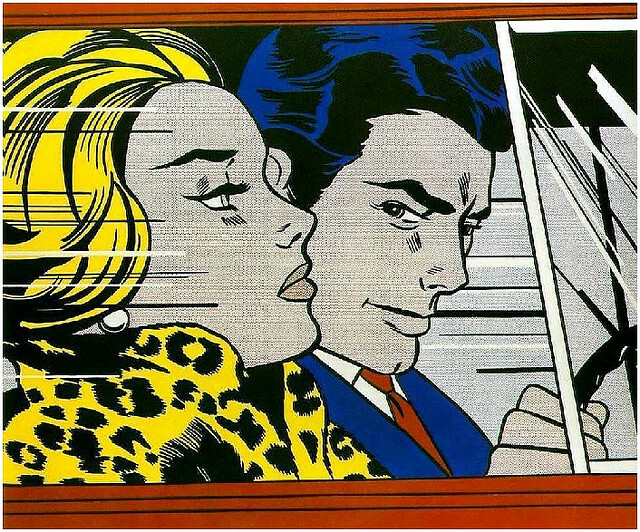 The expression on the model’s face, the full lip and the lined eye bring it back to Lichtenstein. 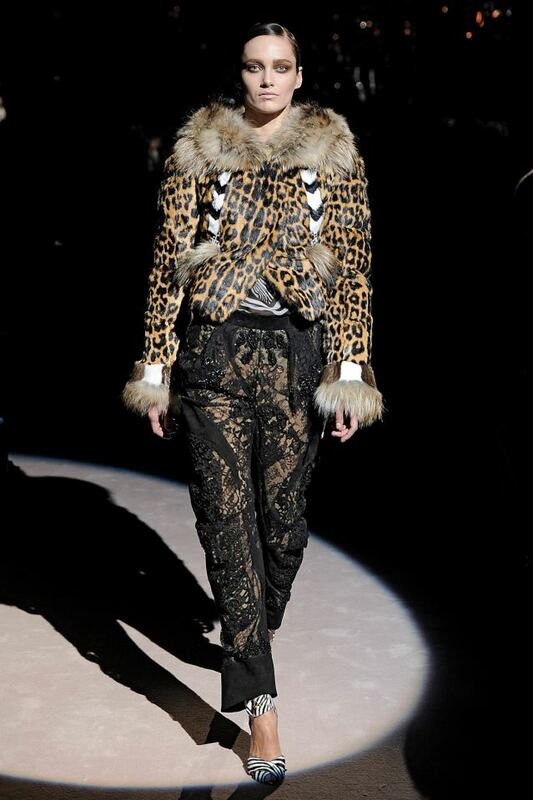 The leopard fur drives it back home, to Texas, where Tom likely was tutored in animal prints. 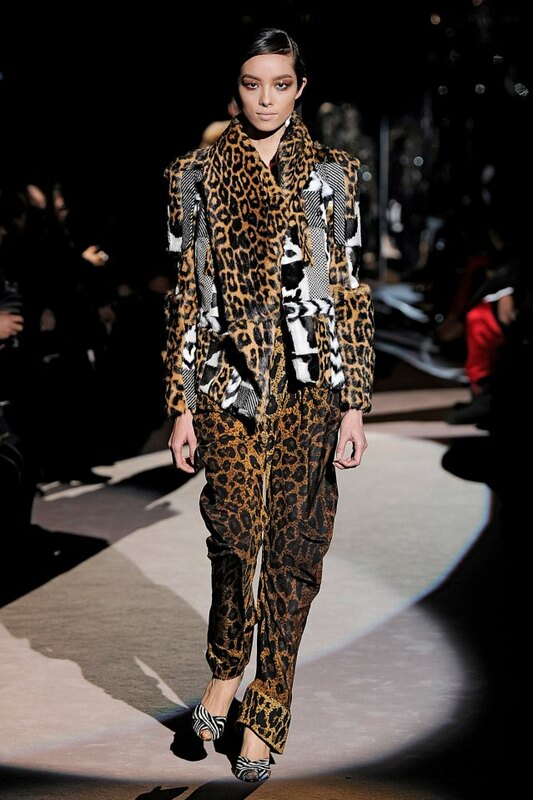 A ferocious mix at Ford FW13. You could say, Tom was mixing his media, perhaps for the media? Just when we thought we had him figured out, he gives us a ‘wham, bam, thank you, I AM Tom Ford!’ wake up call. Nowhere to go-go but up, darlings, for our Mr. Darling. Images: Tom Ford collection pics from Style.com; Lichtenstein prints from Tate.org.uk; Wham! image via Guardian UK, cover sleeve via Wikimedia. Tagska-pow ka-power dressing LFW FW13 London Fashion Week Mr. 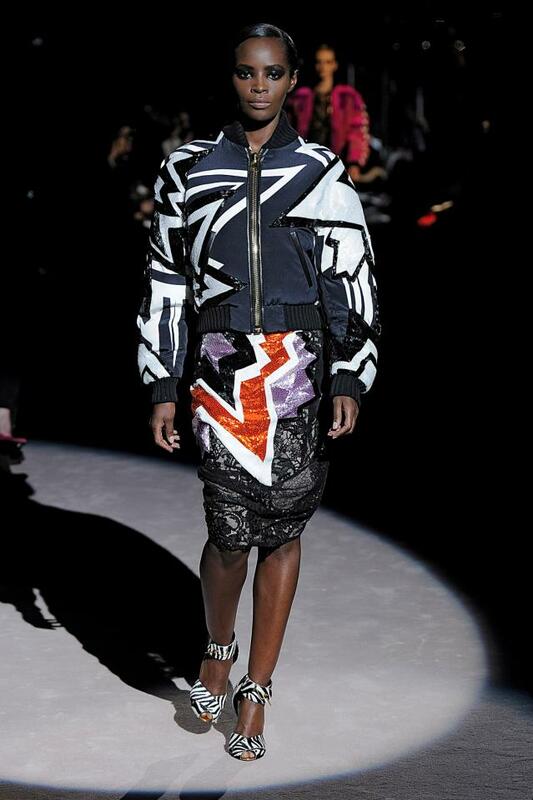 Darling Tom Ford Tom Ford FW13 Whaam!